The legendary Onkelos translated the Hebrew Bible into Aramaic similar to that spoken by the population of Israel around 2000 years ago. 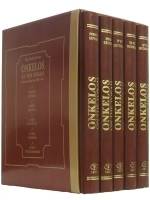 Onkelos On the Torah: Understanding the Bible Text is a unique and remarkable translation and English commentary of the Targum Onkelos, the first and only rabbinically authorized translation of the Torah. The books of Genesis, Exodus and Leviticus are the first three of this five - volume set to be published. This deluxe edition, which contains the Hebrew Massoretic text, a vocalized text of Onkelos and Rashi, Haphtarot in Hebrew with an English translation from the Aramaic Targumim, a scholarly appendix, and a “Beyond the Text” exploration of biblical themes. Israel Drazin is the author of seven books, five of which are on Targum Onkelos. He was the first scholar to recognize that the Targum took hundreds of items from the Tannaitic Midrashim-those that were edited around 400 C.E.-and even incorporated many words found in these Midrashim in his translation. He was able, therefore, to date the Targum Onkelos around 400 C.E., a period much later than is widely accepted, because of the Targum’s reliance upon these Midrashim. Dr. Drazin received a number of rabbinic ordinations, and earned a B.A. in theology, an M.Ed. in Psychology, an M.A. in Hebrew literature, a J.D. in law and a Ph.D. in Aramaic literature. He resides in Boca Raton and Jerusalem with his wife, Dina. Stanley M. Wagner is Rabbi Emeritus of The Beth HaMedrosh HaGadol-Beth Joseph Congregation in Denver, Colorado; Professor Emeritus at the University of Denver and Founding Director and Director Emeritus of its Center for Judaic Studies; and Founding Director and Director Emeritus of the Mizel Museum in Denver. He wrote, edited, or co-edited four volumes, A Piece of My Mind, Traditions of the American Jew, Great Confrontations in Jewish History and Great Schisms in Jewish History and was General Editor of a six volume series entitled Christian and Jewish Traditions in the 20th Century. Professor Wagner received six degrees of higher learning from Yeshiva University, including a doctorate in Jewish history. He currently resides in Jerusalem with his wife, Renee. See a full discussion about this title on Dan Rabinowitz's Seforim weblog. 'Even in the context of modern Christian philo-Semitism, a new translation of a rather specialized Hebrew classic like Onkelos, being marketed by an Israeli publisher to American Christians, is a novelty. Yet that's just what Gefen Publishing House in Jerusalem has set out to do with the release of Onkelos on the Torah: Understanding the Bible Text: Exodus (Feb.). Onkelos was a Roman aristocrat and convert to Judaism who lived just after Jesus (circa 35-120 AD). His Aramaic translation of the Pentateuch is printed in every traditional version of the Torah. In Gefen's handsome new volume and the four to follow (completing the Torah's five books), Dr. Israel Drazin and Rabbi Stanley M. Wagner translate Onkelos into modern English and supply detailed commentary on the 10,000 or so meaningful deviations the ancient translator made from the original Scriptural text. Speaking to RBL, Rabbi Drazin noted as a sign of the times the popularity of Mel Gibson's The Passion of the Christ, with its Aramaic dialogue. Will contemporary Christians pay $29.95 to read a translation from the language Jesus spoke? 'Since 1965, there has been an absolute transformation in Christian attitudes toward Judaism,' Drazin said. That year the Second Vatican Council issued Nostra Aetate which, he said, declared 'that Judaism should not be considered truncated with the birth of Christianity. That launched a search for their Jewish roots on the part of many thoughtful Christians,' both Catholic and Protestant. Gefen publisher Ilan Greenfield said, 'We were definitely thinking of the Christian market from the beginning, a market that is very much a Bible-studying market. We see that in the Christian pilgrims who come to Israel.' Two Christian stores near Buffalo, N.Y., Kairos and Bender's, surprised Greenfield by making orders of 12 and 30 books respectively—two or three times the number he would expect from a Jewish bookstore for the same title. Gefen, which is publishing 3,000 copies to begin with, is in negotiation with a U.S. Christian publisher, New Leaf Press, to distribute Onkelos here. But Christians who read the book might be in for some surprises. As Rabbi Drazin explained, Onkelos casts a light on the proper translation of texts elsewhere in the Bible. Thus in rendering Exodus 2:8, the ancient translator refers to Moses' sister Miriam as an almah, which Onkelos translates as 'girl.' The word is significant to Christians because Isaiah 7:14 speaks of an almah who 'will become pregnant and bear a son' a verse that Christians, rendering almah as 'virgin,' understand as referring to the Virgin Birth.